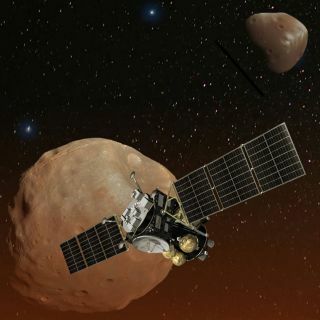 An artist’s illustration of Japan's Mars Moons Exploration (MMX) spacecraft at the small Martian satellite Phobos. A rover will be incorporated into Japan's Martian Moons Exploration (MMX) sample-return mission, which is scheduled to launch in 2024, Japanese, German and French space officials announced Wednesday (Oct. 3). "The rover is to analyze the surface regolith and configuration in great detail to optimize the MMX landing and sample-return operation," officials with the Japan Aerospace Exploration Agency (JAXA), DLR and CNES said in a joint statement Wednesday (Oct. 3). "This process is expected not only to reduce the mission risk but also to achieve scientific result as the rover acquires surface data in advance of the physical sample return to the Earth," the officials added. The main goal of the MMX mission involves determining the origin of Phobos and Deimos, Mars' other moon, which is similarly small. Scientists aren't sure where the two moons came from; some think that they're captured asteroids, for example, whereas others think they're composed of material blasted off the Red Planet by a powerful impact. The space officials specifically cited MASCOT (which is short for "Mobile Asteroid Surface Scout") in their statement, declaring that the newly announced robot will "follow" the asteroid hopper. But the MMX robot won't be a MASCOT clone. For example, the Phobos surface craft will be solar powered, allowing it to operate for several months on the satellite's cratered surface. MASCOT, by contrast, relied on a non-rechargeable lithium-ion battery. An artist's illustration of the MASCOT lander's bouncing touchdown on the big asteroid Ryugu on Oct. 2, 2018. MASCOT flew to Ryugu aboard the $150 million Hayabusa2 mission, which is led by JAXA. The Hayabusa2 mothership also deployed two tiny, solar-powered hoppers, known as MINERVA-II1A and MINERVA-II1b, last month; these little fellows remain active on Ryugu's surface today. Hayabusa2 is also a sample-return mission. If all goes according to plan, Ryugu material snagged by the mothership will make it back to Earth in December of 2020. Mike Wall's book about the search for alien life, "Out There," will be published on Nov. 13. Follow him on Twitter @michaeldwall and Google+. Follow us @Spacedotcom, Facebook or Google+. Originally published on Space.com.